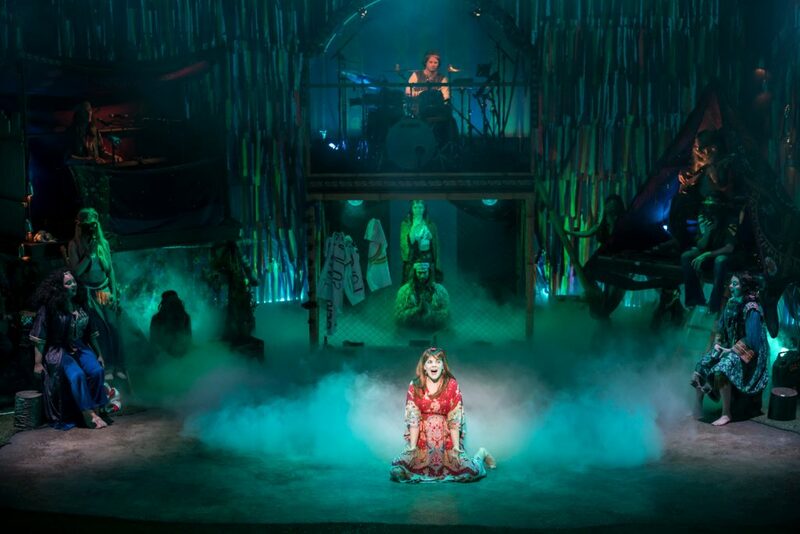 White Light is supplying the lighting equipment for the iconic musical HAIR which is currently touring the UK. 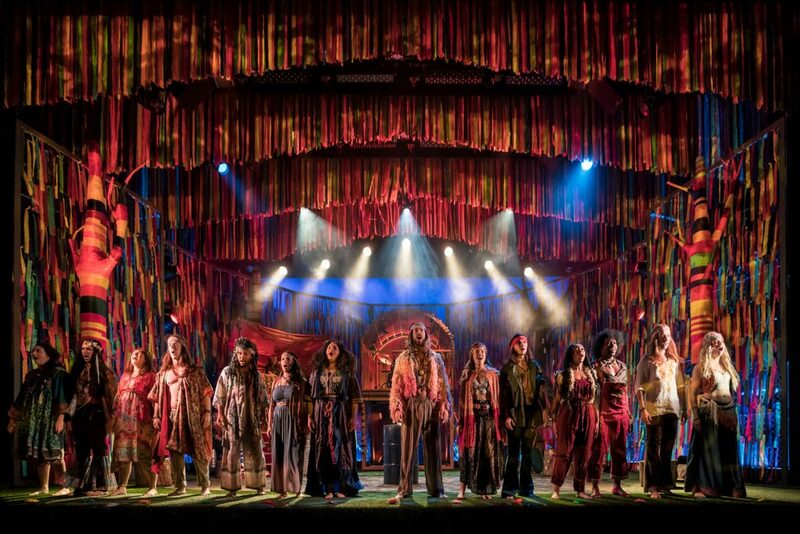 Having first debuted Off-Broadway in 1967, HAIR has gone on to become one of the theatre’s most iconic musicals, following a group of youngsters in New York’s East Village as they begin to question the world, authority and the American flag. Having been revived several times on both Broadway and in the West End, this is the 50th anniversary production and has already received a WhatsOnStage Award. The lighting designer is Ben M Rogers, who comments: “I previously lit this production for its immersive incarnation at The Vaults, Waterloo so this is an evolution of that design into a proscenium format for a national tour. The key design choices and looks remain but are expanded to fill these larger spaces and the enhanced scenic elements”. Ben worked closely with director Jonathan O’Boyle to discuss the aesthetic he wanted to create for the show. He explains: “Jonathan first described the show as ‘a trip from start to finish’ and that has stayed with me. Although it continually breaks the fourth wall, the show mainly alternates between the more naturalistic environment that the tribe inhabit and the abstracted, often drug-infused hyper-reality moments. As such, I looked at how to layer the design to allow these dramatic shifts of tone and focus”. Ben approached WL to supply him with the fixtures to achieve his design. He comments: “I was very conscious of the era in which the show is set and the lighting instruments of the time. That said, I had to ensure the show remained a dynamic music and visual experience. The visible sources in the rig are generally tungsten sources with the LED sources hidden or masked. Although the majority of sources are automated fixtures, the programming and design steers away from live moves and copious colour chases or similar, more contemporary effects preferring the animation to be more period friendly dimmer chases. He continues: “Wash fixtures dominate the rig but the Martin Viper Performances are perhaps the hardest working units with four front of house providing gobo washes and tight shutter cut focuses throughout the show. The rig is a balance of LED sources including MAC Auras, Pixel Battens, Lustr 2 and the new (and awesome) ETC Coloursource Cyc units. The Martin TW1s are the key visible sources to maintain the period tungsten “par” looks with the Viper Performances reliving the highlights and gobo toning”. As this was a touring production of the show, Ben had to adapt his design so that it could visit venues of varying sizes up and down the country. He states: “I’m always conscious when developing a touring design of the practicalities of system design and layout. As a result, the bar weights, power allocations and fit-up practicalities were all considered; taking advice from Production Electrician Stephen Andrews to ensure the show could be delivered without compromise on the road. The prep resources and rack builds at WL also helped with this process”. 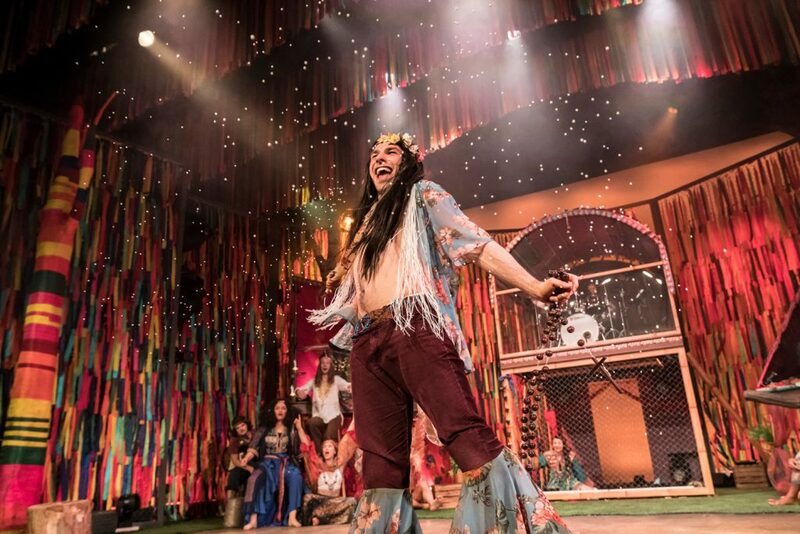 HAIR has now opened and is playing at the Cheltenham Everyman Theatre this week. Photos courtesy of Johan Persson.